Utility Service Specialists | Contact us about Rough Terrain Cranes today! Terex Rough Terrain cranes boast three steering modes, compact and rugged design, boom telescoping even under load, comfortable and ergonomic cab with intuitive and easy controls. These characteristics make these cranes versatile, easy to use and ready to work for long hours, minimizing the fatigue of the operator. The powershift transmission, with six speeds forward and reward and the four-wheel drives allows to reach the place of operation even on very difficult terrains. 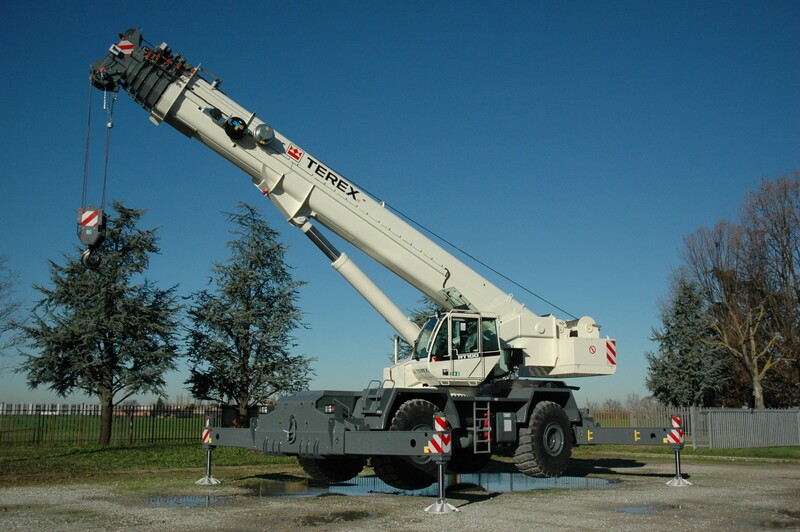 Including the Terex rough terrain crane in the fleet the business became broader and more profitable. Together with an easy and quick serviceability and intrinsic safety characteristics, it is possible to minimize the downtime and maximize the retour in the investment. ML Utilities carries Rough Terrain Cranes from 25 - 100 tons in capacity.